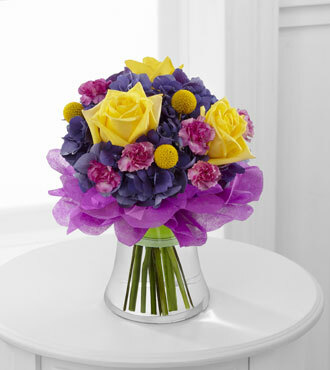 The FTD® Colors Abound™ Bouquet uses roses and hydrangea to send a flower arrangement blooming in eye-catching color! Bright yellow roses, fuchsia mini carnations, purple hydrangea, and yellow craspedia create an incredible bouquet accented at the base with hot pink and yellow wrap sheets. Presented in a clear glass vase tied with a green wired ribbon, this arrangement is set to celebrate their birthday, extend your congratulations or to just brighten their day. GOOD bouquet includes 9 stems. Approx. 11"H x 10"W. BETTER bouquet includes 12 stems. Approx. 11"H x 10"W. BEST bouquet includes 16 stems. Approx. 12"H x 11"W.